"March comes in like a lion goes out like a lamb”, that statement is so true as we change the calendar page. The Northeast has been hit with crazy winter weather, December through February the weather pattern revealed way below average snowfall and relatively mild temperatures, but as that lion of March approached the beast rose up from a dormant winter slumber, and we have been blasted with several snowstorms and freezing temperatures all before the second full week of March has ended. The snow was steadily falling this past Saturday, I thought that the all-day snowfall forecast would hinder attendance for the West Roxbury, Ma. 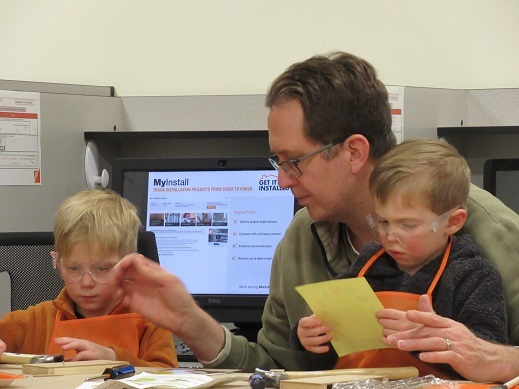 Home Depot, March Kids Workshop, I was so wrong! 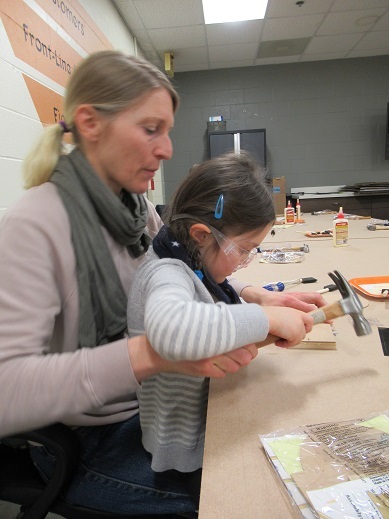 All geared up in boots, snow pants, hats, gloves and scarfs the tiny builders marched into the monthly workshop; equipped with smiles and an eagerness to build. The adults nor the children were intimidated by the stormy, wintery, mix outside, “We are thinking spring” one mom told me as she unzipped her little guy’s winter jacket. 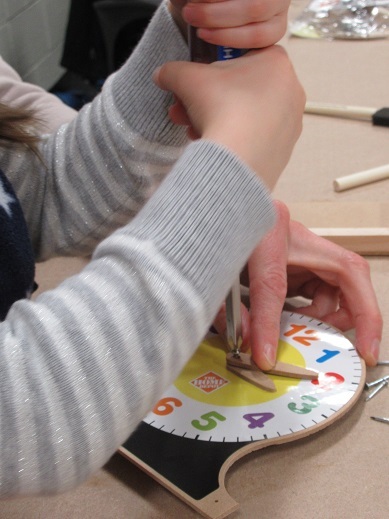 It is time for spring and that was the theme of the KW project, “spring forward”! As we approach the calendar date for the first day of spring and the start of daylight saving, the colorful clock was a “timely” project. I noticed many different aspects of time on Saturday, I was mindful of just how much time it must have taken to get the kids ready to go out into the stormy weather. 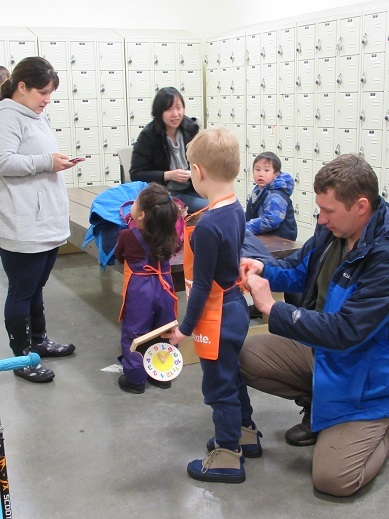 The cars had to be cleaned off and warmed up and a slow, careful drive was taken to get to the Kids Workshop. I watched how long it took for the kids to adjust and remove their winter gear once they arrived...lots of time! 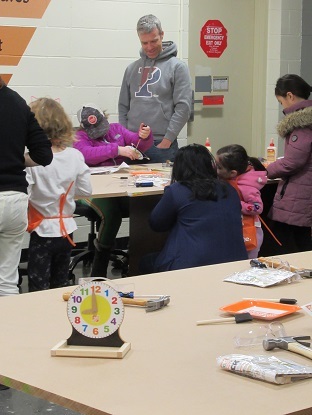 The kids had to wait their turn to get to the workshop table, each child waited while instructions were read, parents took turns helping multiple children. The most time consuming part of the workshop is always allowing the kids to do the project steps themselves, of course, there is constant coaching and helping hands from the adults, holding parts of the project while the tiny builders learn the correct way to use the tools, it is the patience that is taught within the walls of the workshop....that is truly immeasurable. 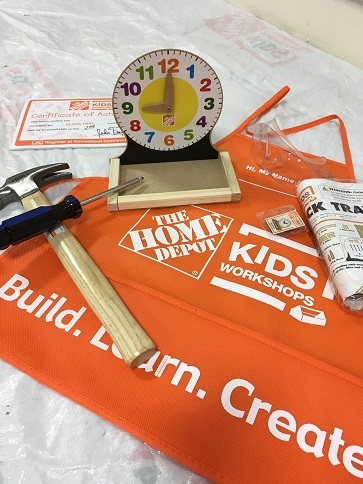 The 2019 March Kids Workshop featuring a clock with a theme of time, once again, made me appreciate these children and all the very patient adults who commit and dedicate a few hours a month to come and build. Time really is the most important part of life, time is the most important thing of all,… if you lose time you cannot get it back, if you waste time you it is gone! If you invest time into a project you will see progress whether you succeed or fail, it is time spent doing, time spent doing is time not lost. You never know how much time you have. If you invest time with a child, any time, time teaching, time listening, time instructing, time sitting, talking, laughing…anytime spent with a child are moments to cherish…it is all about the time! 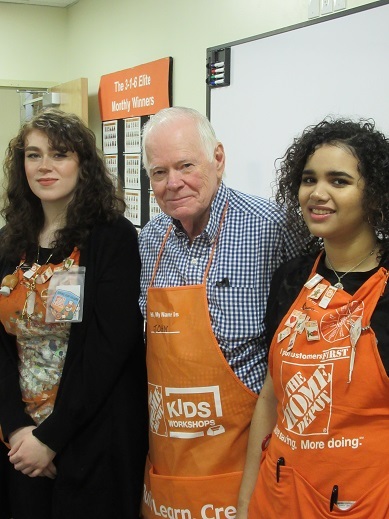 This team devotes time every month at the West Roxbury, Ma. 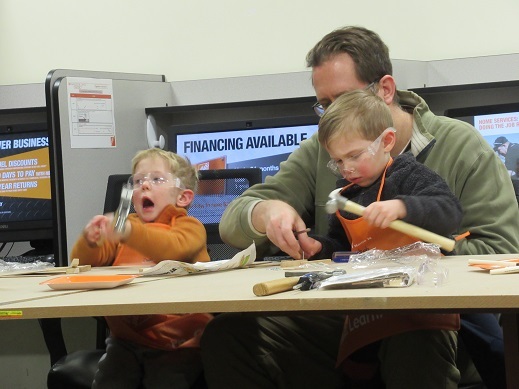 Home Depot, for the Kids Workshop! 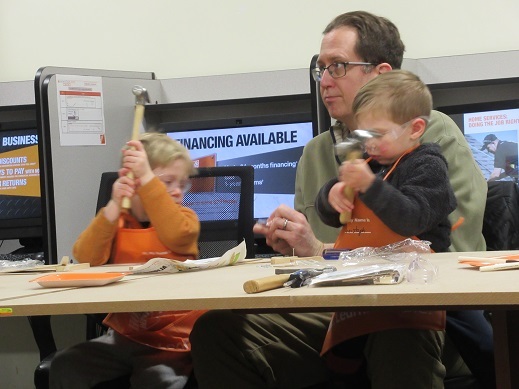 Make every moment count…spring ahead; come to the next Kids Workshop with your favorite little person, the first Saturday of every month 9am-12pm at your local Home Depot, invest time wisely stop by our Kids Workshop the payback is infinite.